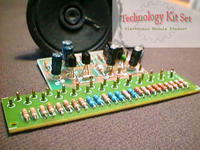 Their catalog includes such favorites as 25 tone organ, Robot Voice Changer and a schematic available for the kit. It turns out to use a 4066 Quad switch IC with a LM358 op-amp. I’ve been working on a similar circuit recently and it is great for gating and gargling up audio signals. Something I may order to try is the 3 Sound effect circuit, with separate ICs for each sound the modding of the effect generation can be quite interesting, similar to the Echo Keyller pitch control. The most advanced kit that comes preassembled is the 4 channel, 16 step programmable LED sequencer for $35 which is not bad. There are not too many clues to its operation except that you have 10 user programmable patterns and 40 factory ones to choose from. 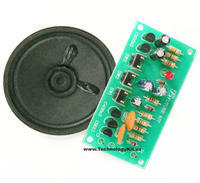 A slew of amplifier kits is also available from the site, along with tone control modules. IMO this is a great way to jump onto synth building or instrument modding.